I don’t like Oreos, but I love freshly baked oatmeal raisin cookies. I don’t like ordinary sliced bread but I love a freshly baked loaf of sourdough. I don’t like fish sticks but I love a thickly breaded slice of haddock with a side of perfectly done french fries and mayo for dipping. I don’t like Nescafe but I love a cappuccino. I don’t like candy bars but I love good chocolate. Some would probably call me a food snob but I would counter with the idea that the foods that call to me are the ones that are made by me, and by people who can read a recipe. The foods I love come from a kitchen rather than a factory. Don’t get me wrong. We eat plenty of processed foods: bacon, jam, All-bran, beans, KD, condiments, salsa, potato chips… and this is just the top of my head. I’ve been known to buy frozen lasagna, perogies, premade meatballs, taco shells. I COULD make all of these things myself, but there is a finite amount of time I have to spend in the kitchen. Also, I should mention that as much as I love good food, I don’t loooooove to cook. I like it well enough, but too often it is the kind of thing that ends up in the chore column. Perhaps I’d feel differently if (a) everyone in my family loved everything I made (b) we had identical taste buds and all liked the same things. It’s disheartening to spend the time to plan, shop, and cook a meal only to have your diners grimace at the thought or make a big deal out of some offending ingredients. I get it though. I wouldn’t be happy if someone served me a plate of fried liver and mushy lima beans and insisted I’d like it IF I WOULD ONLY TRY ONE BITE. Truth be told, there aren’t many foods I dislike, so I don’t have many issues in this regard. I’ll try anything once. (Remember the time I ate crickets? There’s video evidence in case you don’t believe me.) I don’t like organ meats, although I like pâté. I don’t like olives, but I do like tapenade. I don’t like overcooked vegetables, but I think this isn’t an unusual food preference. If by any chance you aren’t aware, Whole 30 is a monthlong dietary reset. It’s pretty much ALL YOU CAN EAT meat, vegetables, and fruit. Sounds pretty great, doesn’t it? Oh yes. You can’t eat grains, dairy, sugar, or booze. My hope is that by the end of the month I’ll lose 5lbs as well as that sluggish and bloated feeling I’ve been dragging around with me. I’m hoping to regain some energy along with a sense of well-being that’s been missing in my life this past while. 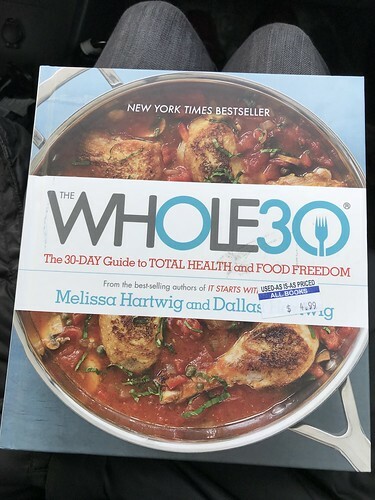 Share the post "March 2018 = The Whole 30"
1 Response to "March 2018 = The Whole 30"
I’ve been wondering if anyone I ‘know’ is doing this. I’ve been on something similar a year ago prior to Easter to treat my eczema but wasn’t allowed fruit in the first week, and then only berries and apples or pears in the remaining weeks (no other fruit allowed). It worked great for the above mentioned issues (slight weight loss, feel better, less fatigue, eczema about 80% cured) but it was hard. SO HARD. Mainly the coffee in the morning, and the cheese, is what I missed most.